The growing competition from pedicabs along Central Park South has many in the horse carriage business looking over their shoulders. Jonathan Whittaker crossing Central Park South near the Plaza Hotel with David and Lynn Fisher of London. The growth in pedicabs has caught city officials by surprise. At first, the giant tricycles did not seem quite so threatening. Pedicabs were more of a novelty than a legitimate mode of transport when a group of environmentalists and artists in Manhattan began pedaling them - and peddling rides on them - nine years ago. But in the past two years, according to unofficial estimates, the number of pedicabs has nearly doubled, spurred by an influx of entrepreneurs and popularized when they were featured on Donald J. Trump's reality television show, "The Apprentice." Long popular in Southeast Asia, pedicabs are now combatants in a quiet war on the streets of Midtown, with tourist dollars as the primary spoils. Drivers of horse-drawn carriages and taxicabs are demanding a crackdown on the unlicensed three-wheelers. Along Central Park South, hackney drivers accuse pedicab operators of stealing their customers in what has long been their domain. Cabdrivers say their exclusive license to pick up passengers who hail them on the streets is slowly being undermined. After years in which pedicabs were seen only as rare curiosities, the city has taken notice of their recent proliferation. Officials are talking about regulating the vehicles, citing concerns about public safety and accident liability. Pedicab operators say the vehicles now number about 220, and officials say the rapid increase has caught them by surprise. "It's burgeoning," said the city's commissioner of consumer affairs, Gretchen Dykstra, whose department oversees hackney carriages and is considering rules for pedicabs. "There are many more of them, and they seem to be popping up almost weekly." Ms. Dykstra said that her department was aware of one nonfatal accident involving a pedicab and that she was particularly concerned about the lack of liability insurance among several pedicab operators. Nearly all the pedicabs, which can carry two passengers, are operated in Midtown. The drivers - many of them students, actors or recent immigrants - typically charge $1 a minute, but a passenger carrying a few extra pounds and traveling a route with steep inclines can expect to pay considerably more. Carriages charge $34 for the first half hour and $10 for every 15 minutes thereafter. Taxicabs charge $2.50 upon entry and 40 cents for every one-fifth of a mile, or for every two minutes when they are stalled in traffic under six miles an hour. Operators say their best business is on rainy or snowy days, when taxicabs are hard to find, and in the evenings, after performances at Broadway theaters or at Radio City Music Hall. Their growing presence at heavily trafficked intersections has rivals complaining, loudly. Cornelius P. Byrne, who inherited his father's stable and hackney carriages in 1964, said the pedicab operators were jeopardizing his livelihood. "These guys have just gone out into the streets, and nobody's questioned them," Mr. Byrne said. "It's kind of crazy. Nobody is asking if it's right, or legal." Mr. Byrne and his brother own 18 horses and 7 of the 68 carriages licensed by the Department of Consumer Affairs. The number of carriages, as well as routes and fares, are regulated under the city's administrative code. The effects of the competition are hard to quantify, but cabbies and carriage drivers say the pedicabs are an unwelcome variable in the grim arithmetic of making a living by operating a vehicle for hire. Mohammed Diarra, a cabdriver for five years, estimates that he has lost 10 percent of his business, concentrated in the Midtown theater and business district, since the pedicabs began to explode in popularity. "Business has definitely dropped off," he said. "It's bad. If I had a choice, I'd get rid of them. The traffic isn't safe, and they pick up our passengers. We pay a lot of money to pick people up in Manhattan." Three months ago, Mr. Diarra said, the weekly rental fee he pays for his medallion rose to $780, from $650. The competition has been especially fierce during the holiday season, as the carriages and the pedicabs vie for the same tourists. At the southeast corner of Central Park on Thursday, people were lining up two rows deep for carriage rides. Pedicab operators nearby were unapologetic about descending on the traditional hub of carriage activity. "We're tempted to pick off their rides," said Mark Stringer, sitting on his pedicab outside the Plaza Hotel. "Generally, we stay off their turf. They have more business than they can handle." But Mr. Stringer, a stock day trader who has driven a pedicab since July, acknowledged that relations were often not amicable. Once, he said, he was riding his tricycle through Central Park when a carriage driver berated him for riding in the right lane long used by the carriages. "He waved his whip at me," Mr. Stringer said, adding, "I think he was being humorous." Far from forming a unified front, the pedicab operators are bitterly divided between the veterans and the newcomers. One of the original operators, George R. Bliss, who is credited with pioneering commercial use of pedicabs in Manhattan, said he was ready to give up the business because of ruthless competition from newer entrepreneurs. "This has just gone haywire," he said, complaining that his drivers are going over to competitors who he said have newer equipment but often do not carry insurance. "I'm losing drivers like crazy." In 1993, Mr. Bliss and a group of acquaintances bought a dozen used pedicabs from a man who had operated them in Honolulu and Miami Beach, before municipal authorities in those cities restricted their use. "When we first started operating the handful of cabs, we were met with both applause and bewilderment," said Peter M. Meitzler, who was part of the group. While the rest of the group fell away, Mr. Bliss obtained accident insurance and started his company, Pedicabs of New York, in 1995. Mr. Meitzler began his own company, Manhattan Rickshaw, shortly thereafter. The explosion in pedicabs has created something of an economic paradox. With competitors sprouting up, no one has established control of the industry, and it is not clear if anyone is making money yet. The old-timers say their tenuous profit margins have all but vanished. Mr. Bliss, a sometime actor and industrial designer, leases each of his 32 pedicabs for $30 to $40 a day, but the income is barely enough to cover the cost of renting his maintenance garage in SoHo. "If these opportunists hadn't arrived, we were going to start raising our rates," he said. Mr. Meitzler, who holds a full-time job as a legal assistant, leases each of his 13 pedicabs for $25 to $45 a day. He said he also made money from advertisements on his pedicabs for Altoids breath mints, Axe men's body spray and deodorant and The New Yorker magazine. The industry might have remained genteel and eccentric, until others saw the potential for profit. Stephen H. Meyer, whose company is a leading pedicab manufacturer, said he has delivered more pedicabs to New York in the past year than in all the previous years combined since 1992, when he started his company, Main Street Pedicabs, in Broomfield, Colo.
Each pedicab costs $3,400 and is made of a steel alloy frame, with 21 speeds, hydraulic brakes and a fiberglass passenger cab that can seat two adults. Mr. Meyer owns a stake in Mr. Meitzler's company, but his leading customer is a young man named Matthew Sanda, who is probably the most prominent of the new pedicab entrepreneurs. Mr. Sanda, 27, moved to New York from his native Trout Lake, Wash., to attend acting school, but now spends nearly all his time at his garage in Chelsea. He and a business partner began their company, Mr. Rickshaw L.L.C., in May with 23 new pedicabs and an accident insurance policy, but it has not made money yet. "This whole year the business has changed drastically," Mr. Sanda said. In March, Mr. Trump may have helped to stimulate demand for the pedicabs when contestants on his show competed to see who could make the most money from a set of leased Manhattan pedicabs. As if pedicabs were not enough, another recent tourist vehicle is the PartyBike, a red seven-seat multiwheeled contraption made in Germany; up to six riders sit in a circle, pedaling, while the driver steers from the rear. Passengers can get aboard outside the Toys "R" Us store at Times Square. The entry of so many pedicabs has heightened the competition among drivers. "We try to have decorum, have some class, but the new pedicab guys don't," said David Sirk, an actor who has driven a pedicab since 2002. "If I'm parked here, trying to sell a ride, some guy will pull up in front of me. Now there are so many new guys, so many new idiots." Last summer, Mr. Sirk recalled, "there was a big brouhaha at Tavern on the Green because the pedicabs were stealing business from the carriages." The restaurant in Central Park has been a traditional pickup point for the carriages. Complaints from cabdrivers have also gotten the attention of the city's Taxi and Limousine Commission. "While the T.L.C. has no regulatory authority over nonmotorized vehicles, drivers have raised a number of concerns about pedicabs with us," the chairman of the commission, Matthew W. Daus, said through a spokesman. "We are pleased that the Department of Consumer Affairs is taking a closer look at this issue." In the summer of 2001, the administration of Mayor Rudolph W. Giuliani drafted pedicab regulations that would have required operators to hold a driver's license and be fingerprinted. The rules would have required headlights, taillights, turn signals, side-mounted mirrors and tire reflectors, as well as seat belts and waterproof canopies for passengers. The proposal was shelved after the Sept. 11 terrorist attack, but city officials may revive it. In July, they convened a meeting with pedicab owners and drivers. "We have begun to explore the feasibility and desirability of recommending a regulatory scheme, but no decisions have been made, and those discussions are not over," Ms. Dykstra, the consumer affairs commissioner, said in an interview. Until this summer, she added, she had not thought much about pedicabs, except for the time in 1998 she rode one, in Vietnam. "The irony is that it's an ancient industry that is new to New York, and so there are lots of questions being asked." I saw that "Party Bike" thing and didnt know what it was, LOL! NEW YORK -- The bicycle taxi trend is weaving its way through the clogged streets of midtown Manhattan, a movement growing so rapidly that the city is proposing regulations before it spins out of control. Known as pedicabs, these vehicles that look like giant tricycles with a passenger carriage in the back are favored by tourists and some New Yorkers as an affordable, pollution-free alternative that can sail through gridlock. The City Council is examining whether this burgeoning fad, grown from a centuries-old form of transportation, needs safety standards, insurance mandates and rate rules. Reminiscent of the hand-pulled rickshaws popular in 19th-century Japan, pedicabs have rolled into many U.S. cities, including Denver, Boston, Houston and San Diego, often swarming stadium parking lots during major concerts and sporting events. A number of cities are considering regulations or have already adopted them. Las Vegas shooed pedicabs away and banned them outright from the Strip, saying they posed a danger to both riders and pedestrians. On Friday in Manhattan, two British tourists said they felt totally safe on their ride through Central Park. "I was a bit skeptical," said Emma Carter, 23, after they hopped out. "But it was great. A fun experience." Pedicabs began arriving in New York City a decade ago, when a group of entrepreneurs tried to market the novelty to tourists sightseeing in lower Manhattan, near the World Trade Center and Battery Park. But over the years, savvy drivers discovered that midtown is pedicab paradise, from the Empire State Building on 34th Street up to Central Park, with Times Square in the middle. They pluck passengers from the throngs of tourists and nab commuters who want to get across town at rush hour or after a Broadway show. "I always ask my passengers whether they have taken a pedicab before, and quite often their reply is 'All the time _ it's faster than a car,"' said Craig Molino, a Manhattan pedicab driver for five years. Officials estimate there are now about 300 pedicabs on the streets of New York, mostly in midtown. Main Street Pedicabs, a major supplier based in Colorado, has been sending the vehicles here by the truckload in recent years, owner Stephen Meyer said. Meyer's model, which features a fiberglass cab, is fashioned like a mountain bike, with a steel alloy frame and 21 speeds. The base price is $3,400. In New York City, there are a number of companies that lease the cabs to drivers, as well as drivers working on their own. Most charge their passengers a starting rate of $1 per block, but fares are negotiated depending on a number of variables, which can include the number of passengers, their weight and the weather. Unlike horse-drawn carriages and yellow cabs, pedicabs are free from regulations and therefore have no fare restrictions and no accountability on safety issues or insurance. Officials estimate that about half the pedicabs trolling for passengers each day are not insured. There are no known fatal pedicab accidents in New York City, but some passengers have been injured in collisions with cars and buses. A 2001 pedicab crash where one passenger's shoulder was hurt resulted in a settlement for nearly $2 million. In San Diego a few weeks ago, a rider suffered a serious head injury when he fell out of a pedicab and was hit by a car. "It is disconcerting that New Yorkers and tourists are riding in these devices without oversight in place _ non-inspected devices that may not have proper safety equipment or insurance," said Iris Weinshall, New York's Transportation Commissioner. "We simply cannot wait for a tragic accident involving a pedicab to occur." The City Council is considering legislation that proposes rules on licensing, training and insurance for drivers. A council committee is also looking at whether the fare-calculation process should be posted in the cabs. Drivers and pedicab company operators say they welcome regulations to help weed out the freewheeling folks who may be cutting corners. "There are renegade drivers out there," Molino said. "God forbid, something happens, it's a bad reflection on the whole industry." Last edited by ZippyTheChimp; March 11th, 2006 at 07:19 AM. Wendy Scher was at the helm of a PartyBike on Saturday as a pedicab passed by in Times Square. The police have impounded several of the bikes. The Bloomberg administration has put forward a comprehensive proposal to regulate the city's decade-old pedicab industry for the first time, seeking to bring order to the human-powered for-hire vehicles that have become increasingly popular on Midtown streets, particularly during the warm months. The proposal would confer legal recognition on the pedicabs, which are similar to rickshaws, except that they are pedaled instead of pulled. Nearly 300 pedicabs operate in the city, but until now there have been no formal safety standards, rules of operation or licensing requirements. The regulations would also outlaw a popular round bicycle built for seven, a multiwheeled contraption in which six riders pedal while the seventh, the driver, steers from the rear. The Police Department has called the bike — sometimes marketed as a PartyBike or a Superbike and mostly used around Times Square — a hazard that chokes off traffic, and has impounded several of the vehicles. "It's not the bike itself, it's how it's operated," James S. Muessig, owner of Superbike, which owns four of the vehicles, said yesterday. "We do it safely and responsibly." The proposal, drafted by the Department of Consumer Affairs over several months and presented to the City Council on Friday, would require pedicab owners to pay a $125 licensing fee each year, and $70 for each additional cab, and to carry an insurance policy covering up to $1 million in liability. Each pedicab would be limited to two adult passengers with one child 3 or younger. Each vehicle would have to have water-resistant hydraulic or mechanical brakes, emergency brakes, battery-powered headlights and taillights, turn lights, reflectors, side-mounted rear view mirrors and passenger seat belts. The pedicabs would be prohibited in parks, on bridges and in tunnels. Owners and drivers who violate the rules could have their licenses suspended or revoked, face fines of $200 to $4,000, and have their vehicles seized. The Bloomberg administration has decided to recognize the pedicabs as a feature of the Midtown streetscape, despite intense feelings on both sides. Pedicab operators say the vehicles are a safe, fun and viable way to move people quickly by weaving in and out of traffic. 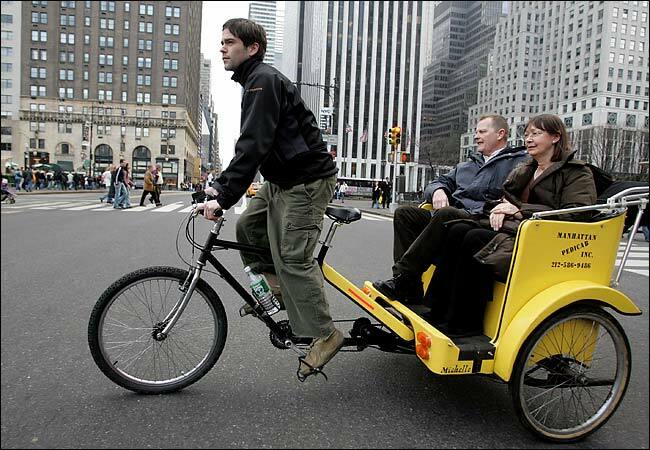 NYC & Company, the city's convention and visitors bureau, has endorsed pedicabs as a popular tourist diversion. However, some owners of taxicabs and horse-drawn carriages have called for a ban, arguing that the pedicabs are unsafe and that a carriage license or taxicab medallion confers the exclusive right to respond to street hails. "Pedicabs are like illegal street peddlers, and they're stealing passengers away from taxi operators," said Joseph E. Giannetto, a representative of owners of large taxi fleets. George R. Bliss, who is widely acknowledged as the father of the city's pedicab industry, said pedicab owners had been calling for regulation because they have had difficulty obtaining affordable liability insurance in the absence of official standards. He leads the New York City Pedicab Owners Association, a trade association that incorporated last month. However, he said he was concerned that the proposed regulations would give the consumer affairs commissioner discretion to limit the number of pedicabs and to set "fitness requirements" for drivers beyond the rule that they be at least 18 and hold a valid driver's license. Mr. Bliss said he also opposed the proposed restriction on pedicab operation in the parks, noting that many pedicabs pick up passengers around the southern edge of Central Park for a ride in the park. Councilman Leroy G. Comrie Jr., a Queens Democrat, has set a hearing on Thursday to discuss the proposed rules. A spokeswoman for the Department of Consumer Affairs said she could not elaborate on the proposal. "Setting up a licensing structure for the pedicab industry is something both the Council and the administration have identified as an important priority," said the spokeswoman, Dina Improta Roskin. The plan was drafted in response to a similar proposal by Councilman Alan Jay Gerson, a Manhattan Democrat. The city's proposal is more comprehensive and somewhat less restrictive, but it would leave pedicabs far more loosely regulated than the city's 68 hackney carriages, regulated by the Department of Consumer Affairs, and its 12,278 yellow taxicabs, overseen by the Taxi and Limousine Commission. The amount of a pedicab fare, for example, would have to be disclosed up front but would be subject to informal bargaining, as it is now. At a Council hearing on Feb. 28, the transportation commissioner, Iris Weinshall, said it was difficult to establish a uniform fare because pedicab drivers tend to charge different fares based on the length of the trip, the weather conditions, the number of passengers — and, yes, their weight. The proposal is silent on the issue of motorized pedicabs, which some in the industry say will be the next contraption to come to Manhattan. Taxicab industry representatives have said they will fervently oppose legalizing such vehicles. "Motor-assisted pedicabs are something we're trying to understand and look at," Ms. Weinshall said in February. Pedicabs have been operating in New York since 1995, but the industry still has a bohemian feel. Many of the drivers are students, artists and actors who work part time. They typically pay $200 a week to rent a cab and make up to $150 in a seven- or eight-hour shift. The cost of a cab ranges from $3,600 to $7,000. "We need to legitimize the industry so that cabbies stop blowing their horns at us and so people start taking us seriously as a form of clean-air transportation," said Robert E. Brennan, 36, an actor and freelance editor who began driving a pedicab three weeks ago. Last edited by milleniumcab; May 31st, 2006 at 01:03 AM. milleniumcab, you being a cab driver I can understand your opposition to the pedicabs but do you really think they are taking away your customers/business? I mean, they cater to a different crowd, an entirely different segment of the business. People that ride in the pedicabs are not necessarily in it for the transportation that taxicabs are for, but more for fun and sightseeing. If anything else, it's the double-decker sightseeing tour buses that they are taking business away, but I don't hear them complaining. So why should you? Apples and oranges. I'm in favor of them. 100% in favor of pedicabs. Last edited by milleniumcab; June 1st, 2006 at 02:34 AM. You must be kidding me to even suggest that taxicab patrons would use pedicabs as an alternative, when such vehicles (if you can call it that) can go only...what...15 mph, tops? Clearly, these people at Grand Central, Penn Station, etc. that you are talking about, wouldn't be taking your taxicab even if there were no pedicabs around. The people that ride your cabs are not interested in pedicabs and those in the pedicabs are not interested in taxis. And as for the "danger" they pose, your motorized vehicle weighing two tons and going 40 mph is whole lot more dangerous to pedestrians than a carriage pedaled by human power going 5-10 mph. Furthermore, while pedicabs may or may not be a time bomb waiting to happen, yellow taxicabs are time bombs that are already happening, and with frequency I might add. Not to mention, they don't pollute like the vehicle you drive around do. And I wonder who's the cause of that. Look, if you're going to oppose what you see as potential competition (although I don't believe that it is), at least come forward and admit that that's the case and not talk about all this time bomb and public safety garbage. You shouldn't be so greedy, let others make a living too. The City got permission to auction off 900 more Yellow Cab Medallions in 2004 and will auction off the last 300 Medallions in June, 2006. This is your real competition, not the pedicabs -- all these extra medallions, not a few guys on bicycles. I take cabs every day. I've never taken a pedicab, and don't suspect I ever will. (Something about having someone else pedal for me makes me feel like a lazy pig.) Why not sue the City for continuing to issue more taxi medallions? The answer is that medallion values keep going up and up, so there are no real damages here. ....Clean energy???? ?....If all the yellow cabs were Hybrid ( soon will be), would you have even mentioned the pollution issue..we don't pollute as much as the rest of the traffic monsters do..trucks?..SUV's?..super SUV's?. Before you claim your unfounded statements in this forum, consider this..
Last edited by milleniumcab; June 2nd, 2006 at 03:57 AM. the taxi medallions are needed to serve the riding public.... I am not so much against the City issuing more medallions as I am for them not protect the rights of the cab drivers..
milleniumcab, nice to have your views.